We love capturing intimate moments with newly married couples. This is exactly what you see here! 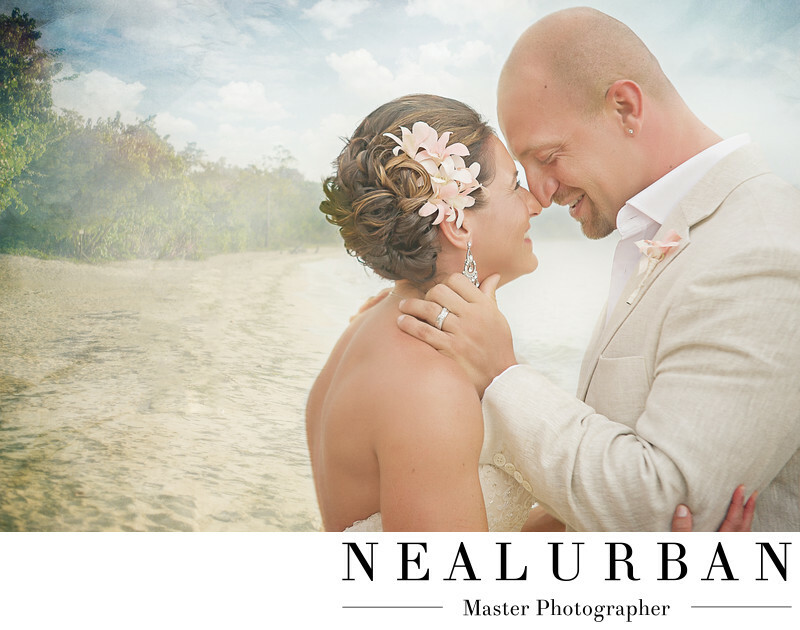 Rick and Leanne had a destination wedding at Sandals Whitehouse Resort (now Sandals South Coast) in Jamaica. It was a gorgeous resort and even more amazing for photographs. On the actual wedding day, we did not have much time for portraits with the bride and groom. Their ceremony on the beach, went right into the cocktail and reception. So, we had another shoot scheduled for the next day where they would wear their wedding attire again. We did this shoot in the early evening before sunset. We shot right through sunset as well! Amazing skies! We wanted to walk down the beach a little away from the resort and all of the people. We wanted more privacy for the happy couple. We did not have to walk too far either. We lucked out and there were not a lot of people where we wanted to shoot. Rick and Leanne are so happy in this image. They are laughing and this helped to create amazing smiles. They have such a close relationship and connection too! We love the forehead to forehead pose too. It always seems to create a beautiful image. Neal edited this photo a little different than most. It looks like it could be painted on canvas. I love the effect! Location: South Coast, Whitehouse, Jamaica.